Manzai were the most popular performances for the New Year. More serious performances and religious dances were performed at temples and shrines. Saijiki for Japanese Buddhist and Shinto Events . Some other popular performances are listed below. More than 70 dancers in colorful robes walk along the roads and shout an auspicious "yui yui", wishing good business and health to the townspeople. They play the shamisen and fireworks are performed along their way. juri was the local pronounciation for the prostitutes (joroo　女郎). They performed special auspicious plays for the New Year only. waka ebisu わかえびす "young Ebisu"
36 people walked around the villages and shouted the outcome of the divination at the shrine Kashima (鹿島神宮), which occured on January 4. The shrine is located in Ibaraki prefecture, Kashima town. It is dedicated to the deity Takemikazuchi-no-mikoto (武甕槌大神) and Matsuo Basho visited there. 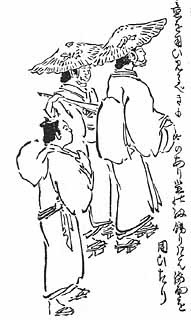 monoyoshi 物吉 (ものよし) "all is well"
In the Edo period, performers in black robes and masks, wearing a cage on the back, walked from home to home and shouted "all is well". These were auspicious words and they would get some rice or money for their service. torioi 鳥追い（とりおい） is an observance performed on January 14 or 15 in the villages. To get the birds (and other unwanted animals) out of the fields. The torioi performers went from village to villate. They wear a straw sack on the back. They get some money for their performance, also some food like mochi. They were not allowed to wear robes of silk, only simple cotton. They had large straw hats to protect them from the rain. we all live long prosperous lives." and other songs during the seasons. The word puppet, just like the word doll , simply used like that, are not a kigo. Dolls are used as toys by girls all year round. Light toy dolls in various forms, even like goldfish, made of styrofoam or tin or other material, which children can use at a pond or lake. The Chinese characters can also be read HITOGATA. You buy them at a temple or shrine, rub them on your bad parts or blow your bad luck on them and have them burned or floated down a river (hinagata nagashi ひとがた流し) , taking away your worries and bad fortune.
. Haiku, Kigo and Dolls . INFO . The vendors carried their tools on the shoulders and set up shop whenever someone wanted a drink in Edo and other towns.